Paul Singer’s Elliott disclosed a 5 pct stake in the stumbling $8.5 bln TV-ratings firm and is pushing for a sale. It’s a surer remedy than auctioning one floundering business unit amidst a protracted CEO search. Buyout firms took Nielsen on once before. Maybe they will again. 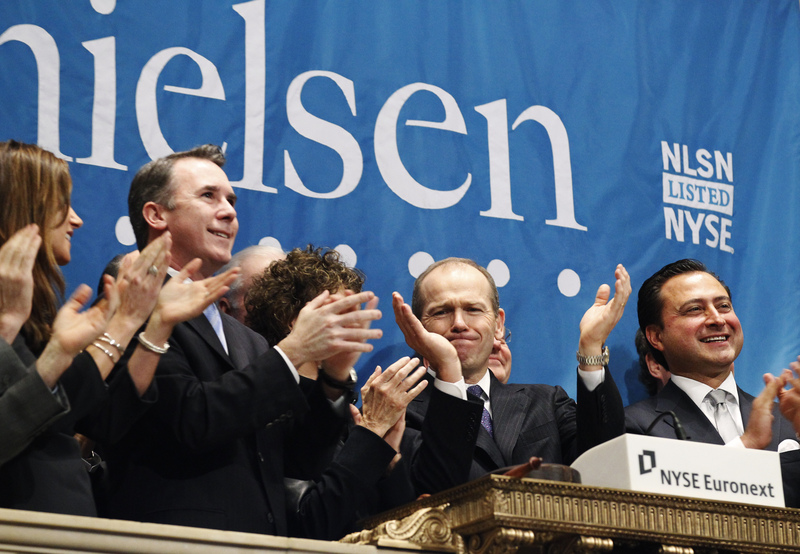 Nielsen CEO, David Calhoun, (2nd R) and company officials ring the opening bell at the New York Stock Exchange in celebration of their IPO, January 26, 2011. Elliott Management on Aug. 13 filed a regulatory disclosure that said it is pushing for a sale of Nielsen and that it holds a 5.1 percent stake in the TV-ratings company's common stock. Together with derivatives, the activist hedge fund said it had economic exposure equivalent to owning 8.4 percent of Nielsen's shares. Nielsen said in a statement the board is continuing to evaluate opportunities and welcomes the views and perspectives of its owners including Elliott. At the close of trading on Aug. 10, shares of Nielsen were down 40 percent in 2018. At 11:20 a.m. EDT on Aug. 13, the stock was up over 9 percent on the day at $24 a share.